Back in 2013, David Montgomery and Taran Campbell shared an ambition to bring a fun, creative, and innovative concept to Scotland… that concept being a trampoline park. Despite having no prior experience in running a business, the duo decided to pursue the idea. But it wasn’t an easy path. Two years later – after numerous unsuccessful bank loan meetings, site visits, and more than 50 landlord rejections – it seemed their dream was slipping away. However, it was at this time that a small industrial unit in Cardiff had become available and, deciding to risk it all, the pair packed up their car and moved to Cardiff without a second thought. Simultaneously, Montgomery and Campbell heard about The Start Up Loans Company – the government-backed organisation offering low interest loans of up to £25,000 to help people start and grow a business. The pair secured the maximum loan amount and, combined with their life savings, set about making their industrial unit purchase a success. Find out how you could get a loan of up to £25,000 from The Start Up Loans Company. Launching their first location on the St. Catherine’s Park industrial estate in July 2015, Infinity Trampoline Park quickly established itself as a leading recreation and leisure facility in Cardiff. Just seven months later, a second park was opened, double the size, to meet demand. 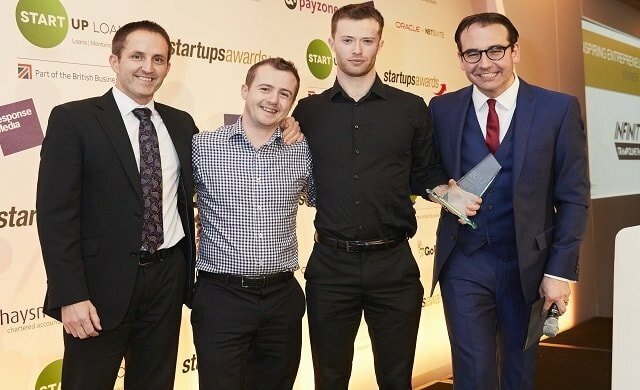 It was this story of tenacity and determination that saw the pair scoop the The Start Up Loans Inspiring Entrepreneur of the Year Award at the Startups Awards 2017. Can you tell us how winning at The Startups Awards has impacted your business? It has been a big motivational boost for sure! The entire team has worked extremely hard for the last couple of years, and the recognition was a great reward for all their work and commitment to date. As start-up business owners, we often found ourselves questioning each and every decision we made, but the recognition of success in the form of an award like this has given us much more faith and confidence in making business decisions. In addition, it has been great for the promotion of the park. It means we can differentiate ourselves from the competition – especially as there are an increasing number of competitors in the market. All in all, it has had a positive impact on many areas of the business, and I won’t pretend a good few drinks weren’t had that night to celebrate either! What exciting developments have taken place for Infinity Trampoline Park over the last year? We’ve focused on improvements to the business, centered on providing an even safer and more enjoyable experience to our customers, ensuring that whilst refining our business model we still build a business we’re proud of. We’ve hired some great new talent, began an exciting new brand refresh, launched an annual Summer Jam event and continued to improve the overall customer journey. We have experienced increased sales, reviews are at an all-time high, and we’ve been awarded Trip Advisor certificates of excellence for both parks. Having almost paid off all of our initial Start Up Loan, we are now able to explore new and exciting growth plans, we have progressed with our new location in Scotland and with the expansion of our site in Inverness. The future of the Infinity brand is looking both bright and very exciting. What exciting developments will take place over the next 12 months? Over the next year we are looking to be more creative and bring in some exciting new features to both parks, expand on our sessions and add to both parks’ timetables. We’re also looking forward to completing the roll-out of our recent brand refresh, with new photography, video content and an improved website. The Inverness park is seeing some expansion with the addition of a mezzanine second floor, complete with café-bar and games area. And our brand will grow massively with plans to open our third park in Moray. What’s been your biggest business challenge and how did you overcome that challenge? Ah that’s simple, it has been the competition without a doubt. We started Infinity with the intention of being the first trampoline park in the UK. But, as the idea quickly took off and when the bigger players moved in, we had quite a fight on our hands, with levels of competition we had never imagined. Thankfully, our customers seem to have enjoyed what we’ve done so far, and we’ve survived a fair bit of market saturation. Although a tough hurdle, we believe we’ve made it through this challenging period as a strong brand. We’re proud to be one of the safest trampoline parks in the UK, as well as one of the most fun (in our opinion)! I think that’s what keeps people coming back. This time last year, you mentioned you were eyeing up Alicante in Spain for a new location. Is this still a possibility? As it happens, the Spanish growth didn’t feel quite right and we think we made the right decision to walk away in the end. That being said, we’re always on the lookout for new opportunities but we are keen to ensure that the brand values, safety record and customer service records are retained – something which is difficult with the addition of international sites. When it came to reflecting on our values and what was important to us in terms of our ethos and offering, we believe that this was the right decision. However, we’ve got one or two potential projects in the pipeline…but a little closer to home. What would you say to an aspiring entrepreneur looking to get a Start Up Loan to bring their business dream to life? One of our very first hurdles was getting the finance to start Infinity, and the vote of confidence from The Startup Loans Company was vital for the success we’ve had so far – we’re extremely grateful for that. When I was growing up my mum used to tell me that everything takes twice as long and costs twice as much as you expect. As much as I hate to admit it, she was right. So, I’d say plan and budget based on that rule. Having said that, there is no reason why you can’t build the business of your dreams, and time and money are merely a challenge to overcome with careful planning. Although it has been difficult at times (which I’m pretty sure all business owners say), it has been worthwhile and what might seem like hurdles have been just that. We’d be lying if we said we haven’t made the odd mistake, but our mistakes have certainly helped us learn and grow the business.